In part 5 of AnimSchool's webcast with Jeff Gabor, Jeff goes over what he would fix in his shot from AnimSchool's "Animation Principles" Lecture, if he had more time. Jeff also answers a few questions including- what type of shots keep him up at night. In part 6, Jeff gives some final advice for students studying to get into the animation industry. 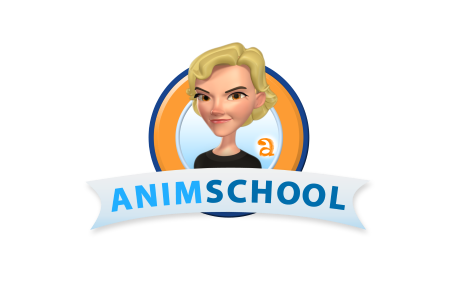 In AnimSchools' Intermediate Modeling class, students choose a character to model into a pose, focusing on appeal. In this clip, Instructor Marty Havran, shows a convenient way to use Lattices while modeling, as he critiques Francisco Tejo's model. Any student enrolled at AnimSchool is welcome to join Mike Mattesi for a lecture in drawing, followed by a critique for anyone who wants to submit a drawing or animation. In his class earlier this week, Mike shared some advice he got from his mentor, Klaus Janson, about personal artistic style. In AnimSchool's Character Performance class, Instructor Garrett Shikuma, lists 10 Acting Essentials to think of, when planning your animation test. Garrett continued his lesson by showing different film clips, illustrating points made in his lecture. Jeff Gabor talks about how he struggled with part of his shot from the AnimSchool's "Animation Principles" Lecture. He also discusses when, and when not to use smear frames in an animation. In Part 5, Jeff goes over what he would fix in his shot, if he had more time. Thanks you Cameron, for taking the time to answer a some questions for us. One word to describe your reel is: amazing! What was the most difficult shot you accomplished? It depends what you mean by difficult. I’m discovering that every shot has some element that seems really problematic as you are sitting in the shot working on it. Whether it's a wide shot, with things interacting, or a 20 frame reaction shot, it seems there's always a period in the process where I`m thinking “oh man.. this is looking horrible.. another failed shot”. Funny enough, it seems that shots I find especially difficult are usually the ones I ending up liking the best when all is done. It's a hard question to answer in short. 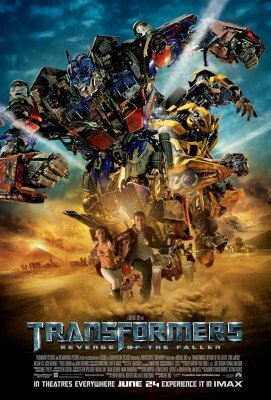 The shot I was most scared of was in Transformers 2, where BumbleBee rips the arms off a Decepticon then kicks him up towards the camera. They cast me that as my first shot, and I was just thinking “how am I going to be able to do this?”... I wasn’t so worried about the physicality and the staging, but more so because I was used to animating in a very layered way that would be very difficult to present as a complete “blocking” idea early on to the director. So, my fears were mixed with not only what I was going to do, but how to do them on a very fundamental workflow level. I ended up planning it on paper as much as I could (this is not usual for me) then blocking it in very roughly in spline. To make matters worse, I got signed off on the blocking, then I was taken off it to work on another shot for a number of weeks. In the back of my mind I was constantly afraid of going back to that shot and making it actually work to the level of detail and realism that was required. In the end, I just layered through it in a way I was used to, but killed myself over a small 30 frame section in the middle that literally took me about a week to get right! I usually find the most “difficult” thing is getting what the director wants, and even more difficult is getting the shot to a level that they really like. Working in video games allowed me a lot of creative freedom with respect to animation choices. In feature animation, you have a broad range of freedom, but hitting someone else's idea is never easy because it's not imprinted on the fabric of how you think things through, solely because you didn't think of it yourself. That I think is the biggest challenge - getting the shot to work as best it can for the few seconds it flashes past on the screen, when “as best it can” is defined by someone else. When you do get it, its incredibly satisfying. Many top animators focus more on physical or acting shots, but you're great at both. How have you balanced those areas of expertise? I started off animating physicality and I'm glad I did because it's the foundation of a believable performance. I don't think it's anymore important than the acting choices and ideas you use in the shot, but it's the first place to start learning animation in my opinion. It's also usually the most obvious to the audience if something is done incorrectly or even just “not quite right”. Even with a subtle acting shot, I still lock down the blocking of the characters physicality, before I start working on the facial animation. The most critical tool I think I have is a workflow approach that has evolved from two distinctively different ways of working. As I mentioned before, I used to animate very layered, not using full body poses at all, and starting with the body parts that drive the performance and basically animating them fully before moving onto the next body part. The other approach is thinking more traditionally, like drawings, and creating poses and breakdowns that describe the performance in a lower resolution (usually ending on two's as the maximum resolution before going to spline). The truth is, it was very difficult to learn how to animate that way after animating layered for so long, but now I use a hybrid of both approaches which I believe is the best mindset. I animate in stepped, creating poses on the full body of the character and keying everything through the main keys of the shot, then instead of progressively breaking down those keys, I work in a layered way in small sections, from start to finish, but keeping everything in stepped and everything keyed on the same frames- but basically still in a layered way. Using this approach, I find I can quickly get down to two's (if I trust my keys and they work nicely) and can get very clear blocking in front of the director without an insane amount of time. Having a good understanding of both these approaches is great because each “type” of shot has its best approach- a physical shot usually benefits from the layered approach, where an acting shot needs the poses and the clarity to communicate the complexities of the attitude, and to be able to fully control the characters design and appeal. How do you usually decide on your acting choices? That's a pretty easy one to answer. With an acting shot- I always use extensive reference to determine my choices. Before I start reference, I check the shot to clarify more technical things like how far the character has to move, the size of the camera lens and that sort of thing so I understand more of the constraints in which I have to move the character, and what the staging needs to be. As far as the subtext of the shot- I make sure I get that clear during the launch with the director, so then I understand what attitudes I need to act within. After that, its pretty much full on reference time, and depending on the length of the shot, I can record a huge amount of takes until I find what I want. It seems to me to take that long to really get into the character and find what feels natural. The “natural” acting is what I'm looking for... something I would never have thought of just in thumbnails. I soon learned that I needed video reference myself for acting shots. In fact, if I can use reference for any shot, I will. I find with acting I just can’t make that stuff up in my head, I need to actually see it. I also make sure I get at least three or four “good takes” and then I watch them in continuity with the animated shots around it. Even though I'm looking at myself (and not the character), it can quickly reveal an acting choice or gesture that looks great by itself but somehow doesn't feel right in the scene. It's become a balancing act with how much I use the reference and how much I don't. Sometimes I get caught up trying to find the “perfect take” only to realize that I simply don't have the skills to act it. I still look for one continuous take (just so the physicality and the transitions make sense) but I'm teaching myself to combine different takes and figure out transitions manually, and be more creative with how I interpret the reference and change it for the benefit of the shot as I start blocking... but its still very new to me animating these kind of scenes. That was a great shot in Megamind where he's facing off against Hal, did you end up shooting video reference and choreographing that sequence? 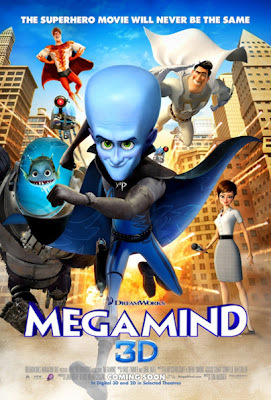 The beats of the sequence had already been figured out in Layout, so with regards to choreography it was more about figuring out the details of the interactions between Hal and the Megamind robot. On the whole it was a tough sequence because of the size difference between the two characters... I shot reference of myself doing “sword-fighting” moves for the robot- but for Hal I just had to work through the shot in stepped, figuring it out in my head (I did the body and the lamp post first, then the arms and the legs). In the end Hal had to do big broad movements to get the battle to feel like they were really fighting, and he was at least some kind of challenge to the robot. A bi-product of this was that his motion seems somewhat fast, but this further adds to the feeling of miniaturization and helps make the scene a little more funny to watch. What's the best way for student animators to strengthen their understanding of body mechanics? The best way for students to strengthen their understanding of animation is just to animate what they love the best. I would say that every animated shot, even a subtle acting shot are riddled with body mechanics, so you can pretty much animate whatever you like and you'll end up dealing with physicality in some form. If you just animate that thing in your head you’ve been waiting to animate for so long, it's almost guaranteed to be good just because it's driven by your own passions and interests. You can animate the ball bounce and box lift and that kind of thing if you like, but I would put much more return on animating something more complex, and studying reference of yourself doing it. My experience tells me that the classic exercises will teach you exactly that- how to animate a very simple and contained set of physical motions, whereas actual production shots require much more complex movements. You could say there are two types of physicality- the really broad stylized motion, and a more realistic natural motion. I would suggest studying how natural physicality works by trying to animate it yourself before going all out and animating abstracted physicality, which in truth takes a lot longer to learn and understand (in my opinion). How did you find the transition from VFX to animated features? What are the differences and similarities you've discovered? My experience in the VFX field is somewhat marginal. I was lucky to work at ILM for about 4 months, and it was an amazing experience. Something I learned very fast was that the VFX industry can be very tough for a family man like myself... short contracts and gaps in work are not the best combination, even more so if you're not native to the US and have to deal with immigration issues in tandem. ILM was great, and looked after me very well however. Concerning the work, at least the one project I worked on at ILM, was more concerned with the broad visual impact and raw entertainment value than any real character driven moments (at least the shots I worked on)... which was really fun, just to concentrate on making it “look cool”. Animated features on the other hand, deal much with story and character, and this is a different skill set that has to be learned- not just how to animate those shots, but even more so to understand what is important about the shot, and how to construct it from a film making perspective. I also find that shots for a feature are much more open to changes and notes from the director, and in general the process of completing the shots seems a lot more iterative. As for similarities, you still have to think about a lot of the same things. Continuity is a big one, and not with respect to just making sure that things don't appear or disappear and that kind of thing, but more to do with the flow of the shot and the feel that the action is taking place consistently when the camera is not looking at the characters (i.e the world exists and continues even when the camera is not looking). As with all shots- we are still mainly reaching for entertainment. How do we make the shot as entertaining as we can, and that doesn't change between VFX and feature stuff at all. It's a double edged sword. Sometimes I miss the “coolness” of the VFX type shots, and sometimes I’m very happy to animate the intricacies of a feature shot. I can never make up my mind which I like best, and the truth is, I have a drive to animate both types, that swings like a pendulum on steroids! I very much want to return to VFX in the future. We're all artists, and need variety and varying challenges to keep us fresh. You've worked in the entertainment industry for the past 10 years. In those years have you ever felt the effects of burn-out, or days when you don't feel like you're an animator? I have to say that almost every day when I come to work, or sit at home, or just play with my kids I feel like I'm “not an animator”. It's very hard to describe why, and sure I work on shots for my day job and actually spend more time animating than not animating, but creative fulfillment is very hard to come by, and I don’t think I’ve ever really had it... weird hey? I have times where I feel like my shots are going well, usually during the later parts of blocking where the main shot is roughed in and working...basically when all the hard work is done. Strangely enough however, it's hard to hold onto that satisfaction you feel from watching your own work, probably because of the sheer amount of times you watch it and you get numb to it. I tell myself this is a symptom of the strive to do my best, and as long as my colleagues and peers are telling me the shot feels great, I can trust their objective opinions. I usually find seeing a shot much later on, after I've had time to forget about it, allows me to see it with fresh eyes and appreciate it. This doesn't always happen, from time to time I have shots I feel work really nicely and I enjoy watching them, but these are the little gems we have to dig for. I think the thing we struggle with as artists is that we constantly compare ourselves to others, and vastly over criticize the work we complete ourselves. The reality is that art is an ongoing journey, trying to reach a goal that we constantly shift further away as we get closer to it. This is what makes us strive for better work and improves us. Part of being an artist is learning how to manage these feelings and understanding that anxiety is part of the process. I strongly believe that a great way to get closer to artistic satisfaction is to work on your own projects at home. I try as hard as I can to do this, but my work and family life leaves very little room, and it's incredibly tough to complete anything at 11:30 at night when you’re tired and you have another long day in the morning. I'm currently in the very early stages of a “cool” creature sequence I'm working on - just simply for my own education and fun, nothing more. 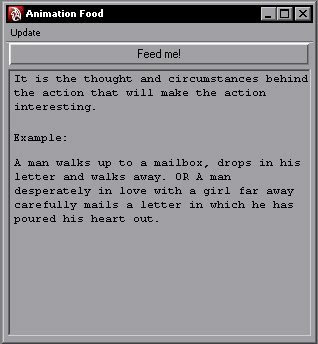 You made a script, a very random one called the 'Animfood'. What were you thinking that day? AnimFood is awesome. I wanted to create something that could inspire me, or make me think about my shot, or a particular problem in a different way.. without having to do much more than press a few buttons a couple of times. The truth is that the actual content for AnimFood (its called “randoFlip” on the website) took a long time to compile and is from numerous sources, so it was fun to research and ultimately is really helpful to me from time to time. I love building scripts and tools. The beauty of code is that it works or it doesn't. No inbetweens, it's not subjective. If I can create tools to help make my animation easier or allow me to experiment more easily, then I do it. I like being able to do two completely different things, but be able to use them together to get me closer to my creative goals. One thing I've taken away from your incredible site was when you said, don't force animation principles to guide how you construct a scene, or as a checklist to your work. Would you mind elaborating this further for all the new animators who scratch their heads over this. I think what I meant by this was to try and think of principles after the fact. So, if you had a character that was picking up a ball, you might not want to think like this “ok... so I need an antic, some squash as he bends down, some overlap in the back as he comes back up, and some lead in the head at the start”, I think that approach will allow you to think about principles rather than the story you’re animating. I would like to approach the shot thinking about an interesting way to perform the action, and then use principles to further the communication of the ideas I already have for the shot, and as a tool for clarity (which is really all the principles are about anyway). Lastly can you tell us what's next for you? Are we going to see more flip reviews on your blogs, more workflow demonstrations and more possible random scripts? I desperately try to keep my personal work and the Flip site going as much as I can. The thing with the Flip site is that I still stand by my “mission statement” that I only post stuff on there that feels substantial and has educational purposes for me, and the readers. Unfortunately, I think it might not be obvious to people how long those kind of posts can take to create.. its tough. The video review thing went on hold as soon as I realized that my five year old laptop can’t handle them at all.. so I need to rethink that, as it was pretty fun for the few that I did. I definitely plan to do an updated workflow tutorial that discusses, in useful detail, how to create a shot with my layered and stepped mix. Hopefully I`ll have some new creature animation to show when I get around to completing that too. I know my Flip blog gets rarely updated, but I would like to keep it relevant, and not just post links, or stuff that I don’t feel benefits the community. If people want to drop me an e-mail with questions or topics to discuss that would be cool! Cameron it's been a pleasure doing this, I hope we see more awesome stuff come out of http://fliponline.blogspot.com/. If you guys haven't head over there. Cameron has some great animation tutorials spanning over 10 years in the business. This man's a genius. Thanks again mate! AnimSchool Instructor and Blue Sky Animator, Thom Roberts, begins to discuss balance and weight for his Introduction to 3D Animation students for their last assignment: turning 90 or 180 degrees. Jeff Gabor discusses appeal in characters by going over his Malcolm poses, from his shot in AnimSchool's "Animation Principles" lecture. In upcoming Part 4, Jeff goes over smear frames.